Valued for the timber Ironbark trees are found over a wide area of Australia. They are harvested and the wood used for use as decking, raised garden beds and retaining walls. It is a little difficult to define the Ironbark tree as Ironbark refers to a number of different species. These include the red Iron barks, Eucalyptus tricarpa, Eucalyptus sideroxylon and Eucalyptus crebra as well as the Grey Ironbarks, Eucalyptus drepanophylla, Eucalyptus paniculata. The great thing about all of these species is the durability, in-ground they are rated as ‘Class 1’ which indicated a life expectancy over 25 years. They are also regarded as being termite resistant. Ironbark along with Redgum are regarded as two of Australia’s most durable and long lasting timbers. They are resistant to termites, and are also more fire resistant than many other timbers. Timber colour will vary from species to species as well as from where in the tree the wood is cut. Heartwood can differ in colour from other wood. Some trial Ironbark plantations are now being planted with perhaps this becoming a sustainable building material in the near future. Ironbark species do not shed bark each year, it builds up on the trees forming a very hard dense outer bark. This gives it its name and also helps the are survive heat, drought and fire. 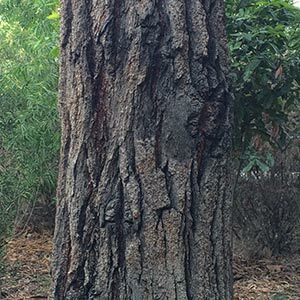 The importance or Ironbark species in gardening and horticulture can not be underestimated. It is one of the best timbers for raised garden beds and also one of the best for retaining walls. It outlasts most others by many years. Ironbark trees being long lived and relatively problem free are also being used in street plantings where they suit wider streets and work well planted in avenues. One example is in Maffra where they are being used in Powerscourt Street near the Secondary College. Eucalyptus sideroxylon. – Red Ironbark or Mugga Ironbark. Red flowers.